Street Artist or Graffiti Vandal? On a related subject to the article that follows after this, I’m moved to comment on an interesting controversial art exhibit that shows off street art, graffiti etc. Is it really art… or vandalism!? The fact that I am a professional art conservator interested in the preservation, protection of murals you might say, “Duh.” But I’ve had emotional deep felt discussions with Kent Twitchell, Willie Herron, Thomas Suriya and Judy Baca (four of the most famous mural artists in Los Angeles) who paint in the streets and they have VERY strong opinions on this issue. There’s really not a gray area. I come from a position of experience dealing with the damage caused by “street artists” who think they have rights or freedom of expression to vandalize, deface private and public property, ruin true works of art that have a legal right to exist and whose defacements represent and promote the dregs of society. The only justification that these outlaws have is the same mentality that they think justifies anarchy. If you didn’t understand that last statement, well, it means “stop tagging, its wrong” (as if that will help you “get it”). 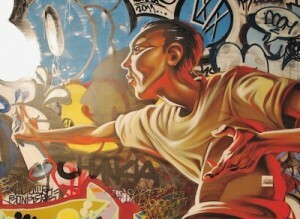 The show at MOCA shows off the art skills of some great street artists. Don’t compare these skills to the scribbled comments and scribbles on walls you will see around town. Some of these artists are true geniuses and their art is amazing. There is a place for it and it beautifies and stimulates a community. The difference between their art and graffiti tagging is the difference between the NBA and backlot pick up ball in grade school. But MOCA blew it big time. They confused the public’s perception and actually taught the public through different media about the skills of taggers… not artists: destroyers of public and private property. The MOCA show, while making a small obligatory mention of tagging being bad, there was not a “stand taken” and a line drawn between tagging and quality street art. There was no teaching. In the interest of misguided freedom of expression, they missed the boat on educating the public and did not express both sides of the difficult and insidious debate/problem. The Mural Conservancy of LA Executive Director, Isabel Rojas-Williams told me they connect with many past teenage taggers who are now grown up, with families, jobs etc. They almost universally express regret for having defaced and vandalized… especially the works of public art by the great muralists. A teenage brain fart that causes damage to private and private property and public art is wrong, bad for society, bad for the soul and a counterfeit imitation masquerading as (in their minds) art in the streets. 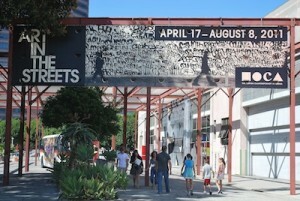 “Art in the Streets” at the Museum of Contemporary Art missed making that distinction in a clear and public way. Freeway murals in downtown LA are really a study on the subject of the battle against graffiti and tagging vandals. Caltrans (the highway maintenance authority in the State of California) is required by law to keep graffiti under control and off walls… even if those walls have really great murals on them. 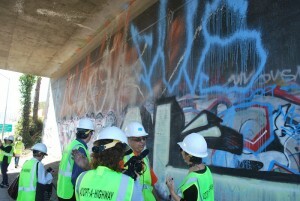 The Mural Conservancy of LA is the main voice lobbying to protect and save the outdoor mural creations of artists in LA. So, you would think these two entities would be at odds. But I attended a meeting with representatives from both of these two organizations on Thurs. 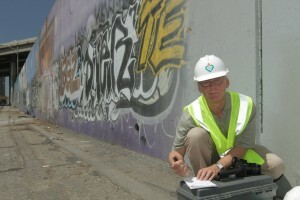 April 28th, 2011 as an art conservation consultant and expert with the purpose of figuring out the problems associated with preservation, conservation and restoration of these great works of art in the form of murals along the sides of freeways. This was not a run of the mill meeting, in a corporate office with suits. 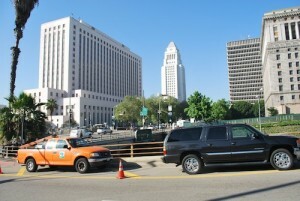 We met, as you might guess, in the office of Caltrans: behind fluorescent orange cones, closing down a traffic lane in downtown LA at 8 am in the morning. They are the “gods of the highways.” We got a “do or die” safety orientation, then followed dutifully to an on-ramp by an overpass with obliterated murals by the best and most famous outdoor mural artist in Los Angeles, Kent Twitchell. We parked behind the same orange cones where you will NEVER get to park in your whole life and took the short walk to stand in front of the murals. There we did tests, measured the dimensions, took pictures and video and discussed the past efforts by several well meaning organizations over the years. We did this procedure for 4 murals in different locations, one completed painted out and no longer visible. 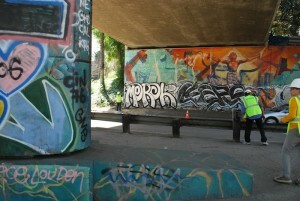 There have been some new developments and new techniques in graffiti removal and mural protection. There was encouraging dialog and a commitment to discuss, cooperate, test the procedures and make progress with this insidious problem. “Fired up” would be a good way to express the expectations of further efforts and expected positive results. We’ll keep you informed. It shouldn’t be too long into the future. We’ll post very cool, compelling photos and some very unique video on several websites. This entry was posted in Murals and tagged art conservation, Caltrans, cleaning painted out murals, MOCA, Mural Conservancy of Los Angeles, Mural conservation, mural restoration, Scott Haskins. Bookmark the permalink. All the comments after the article are pretty much coherent about the difference between graffiti street art and graffiti vandalism.